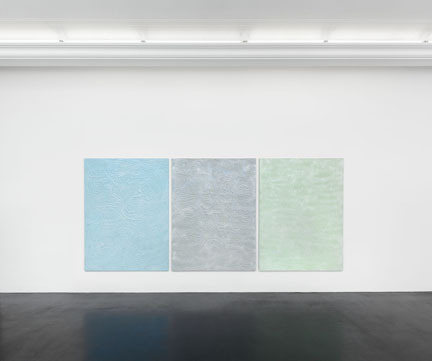 Mus­cle Mem­ory at Peres Projects has been cho­sen as an Art­Fo­rum Crit­ics’ Pick. Read more here (http://artforum NULL.com/picks/id=53648). Artsy has listed Donna Huanca an an emerg­ing artist to watch this sum­mer. Read the full arti­cle here (https://www NULL.artsy NULL.net/article/artsy-editorial-30-emerging-artists-to-watch-this-summer). Work by Donna Huanca is on view at Halsey Mckay Gallery as part of a group exhi­bi­tion Per­for­ma­tive Prac­tice curated by Ryan Stead­man. Open April 18th through May 3rd. More infor­ma­tion here (http://www NULL.halseym­ckay NULL.com/performative-practice-curated-by-ryan-steadman-press-release). Donna Huanca’s solo exhi­bi­tion Water Scars opens April 18 at Galerie Chez Valentin. More infor­ma­tion here (http://www NULL.galeriechez­valentin NULL.com/fr/expositions/2015/DonnaHuanca2015/). Donna Huanca’s ECHO IMPLANT is fea­tured as a “Must-See Gallery Show” on Blouin Art Info. Read the arti­cle here (http://www NULL.blouinart­info NULL.com/photo-galleries/5-must-see-gallery-shows-nancy-graves-steven-cox-and-more?image=22).